In addition to the three Cromarty churches, two other venues are suitable for wedding ceremonies. The Stables is a converted Georgian building located above the town of Cromarty on the road to the South Sutor. In addition to workshops and artists' studios, it contains a large, open upstairs gallery suitable for exhibitions and celebrations. It holds a Civil Wedding License. The venue can be hired any day of the week. A maximum of 100 guests can be accommodated. A fee of £1800 inclusive of VAT is charged for a wedding and reception in the Stables. This gives the wedding party access to the Stables from 2.00pm the day before the wedding to allow for setting up, until 1.00pm the day following the wedding for clearing away. The wedding party can use the Gallery, West Wing, Downstairs tea-point and the Grounds. The wedding party can use all furniture and equipment provided by the Trust in the above areas. A staff member will be on hand in the run-up to the wedding to allow access to the building for caterers, photographers, florists etc. A 25% deposit is required once the Booking Confirmation is signed and dated. The balance is due four weeks before the wedding. For further information, call the office on 01381 600354 or email on info@cromartyartstrust.org.uk. A wedding Booking Form, giving full details, can be requested via email. Cromarty Courthouse is an elegant and historic building, completed in 1772. It was the civic centre for the community, where sheriff courts and council meetings were held and the striking of its bell — which came from a Spanish ship — still marks the hours in the town. 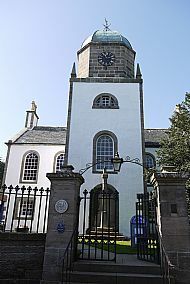 In 1989 the restored courthouse re-opened as a museum telling the story of Cromarty and the surrounding area. 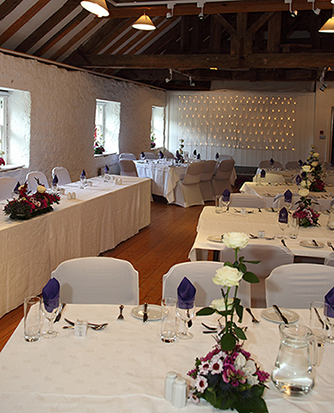 Our 18th Century Cromarty Courthouse Museum is a unique setting for weddings, which can cater for groups from 4 to 60. Take a look at our wedding album to see some of the people who have enjoyed their special day at the Courthouse. Contact us at cromartycourthouse@gmail.com for more information.